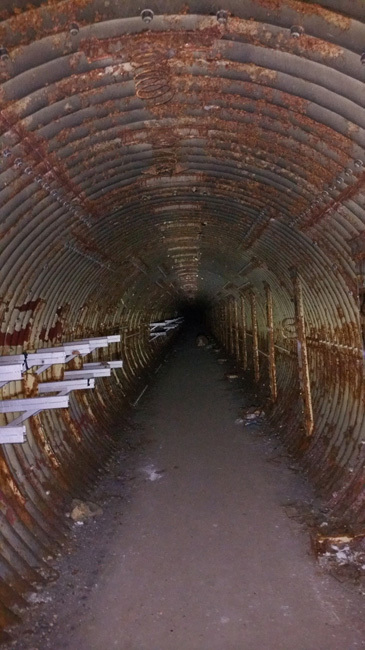 Deep beneath the plains of Deer Trail, Colorado lies a hidden system of tunnels that once housed instruments of nuclear annihilation. The morning after my exploration of Southeastern Colorado's incredible ghost towns I woke early and drove to the remote town of Deer Trail, Colorado. 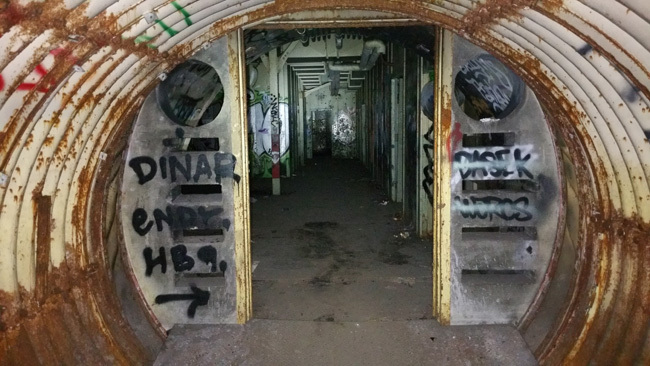 I wended my way to the site of the only Titan I Missile Silo still accessible to those bold enough to explore it. It was a very cold morning with a biting wind, so I bundled up in several layers and ventured out. 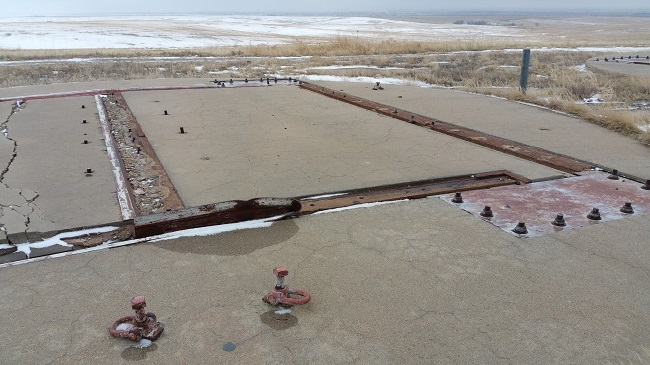 There are two entrances to the missile silo complex that do not require rope and repelling gear, and the easiest is a metal gate at the bottom of a large depression in the ground. The gate was welded shut long ago, but several bars have been removed by unknown adventurers to allow access. 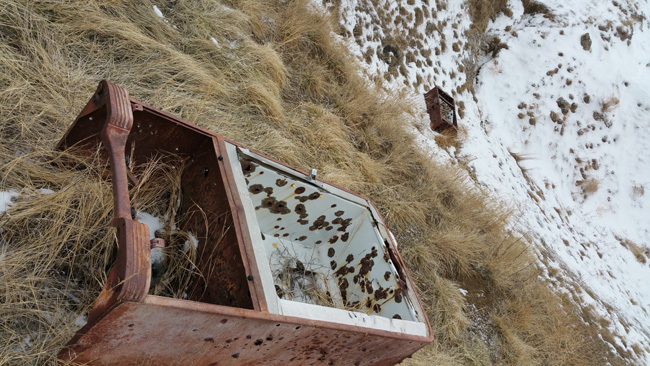 Several discarded, bullet-ridden refrigerators lay nearby. Immediately inside the main entrance is a collection of tumbleweed and, because I visited in early March, snow and ice that had blown inside. Surprisingly there was no indication that animals had sought shelter within the complex. The long dark passageways seemed an ideal refuge from the harsh Colorado winter, but something about the place seems to repel wildlife. I'm guessing it's the strong unnatural odor that hangs in the air, the result of chemicals, rust, and decay. I wore a fairly heavy-duty breathing mask, which kept my lungs safe, but the few times I took it off to adjust it, the strange industrial smell was pretty strong. 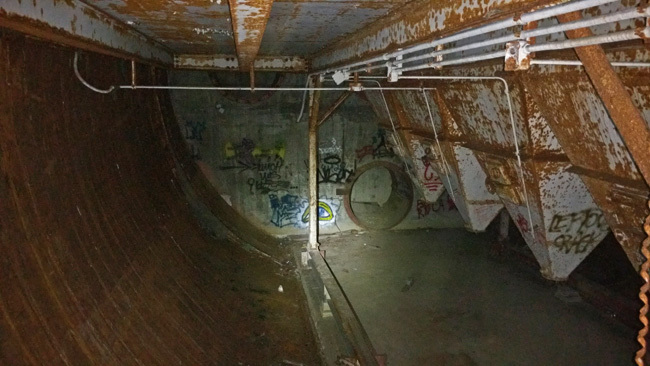 I followed a corridor to an area where large pyramid-shaped structures hung from the ceiling. 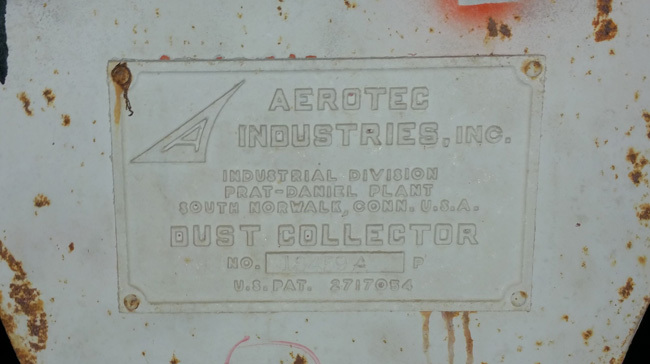 Upon closer inspection I found a plaque indicating that they are dust collectors. Unfortunately it has been many years since they were operational, and there was quite a lot of dust in the air. 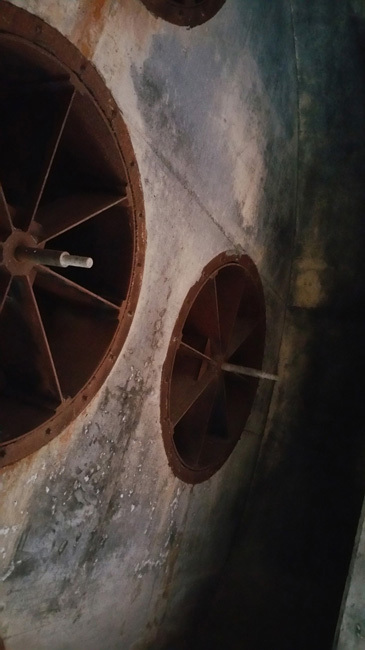 The first section I explored appeared to be an air intake/filtration facility, judging by the huge fans. Massive pipes and hoses also occupied the area. Below is a diagram of the typical layout of a Titan I launch complex, though it makes no mention of an air filtration facility. Next I explored the Power House. It is absolutely gigantic. 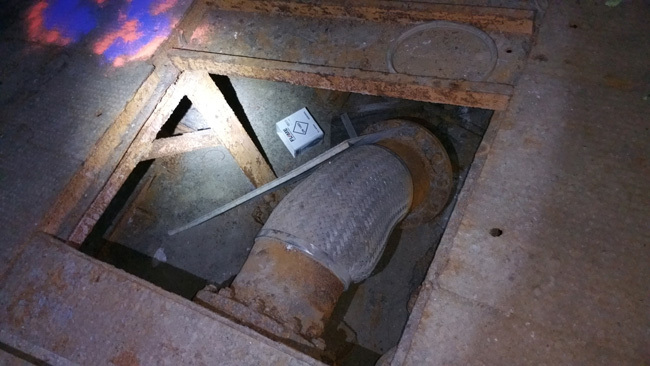 Due to the enormity of the chamber, I was not able to adequately photograph it because my flashlight and headlamp did not throw off nearly enough light to illuminate its cavernous extent. 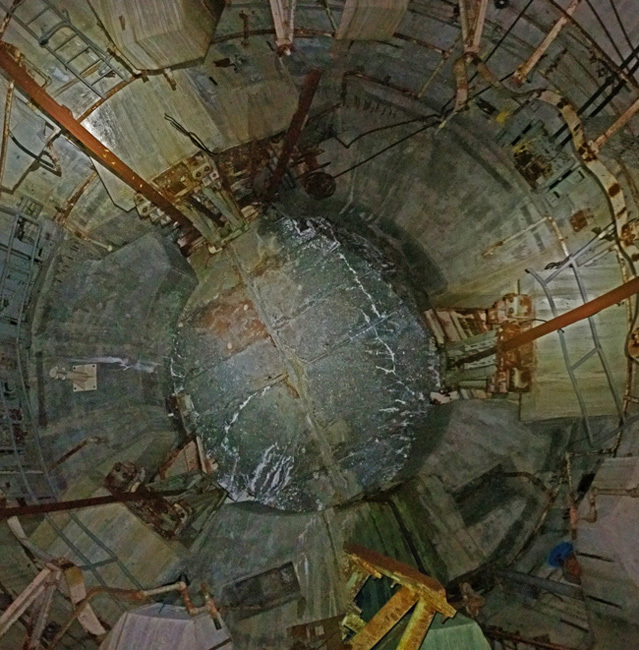 The Titan Missile Silo is a difficult place to photograph, not only because of the pitch darkness, but also the dust particles floating through the air tend to catch the light and interfere with focus. I carefully walked out onto the catwalk along the upper portion of the power house. 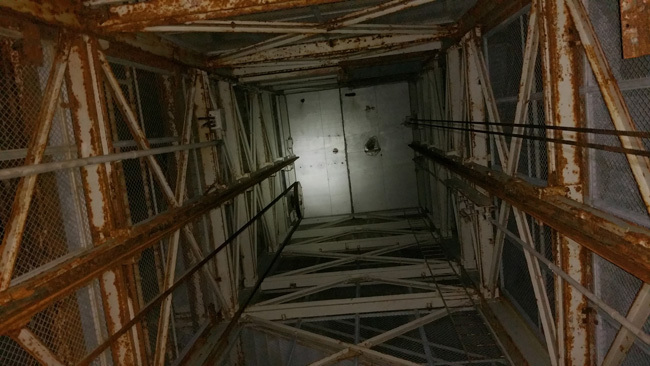 The mesh grates that used to cover the catwalk have mostly been removed, leaving huge gaps through which one could easily fall to the ground far below and end up severely injured or dead. 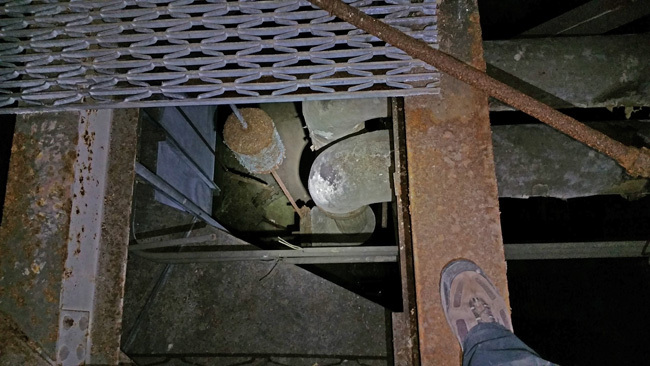 I was careful to watch my footing as I walked along the thick metal beams. 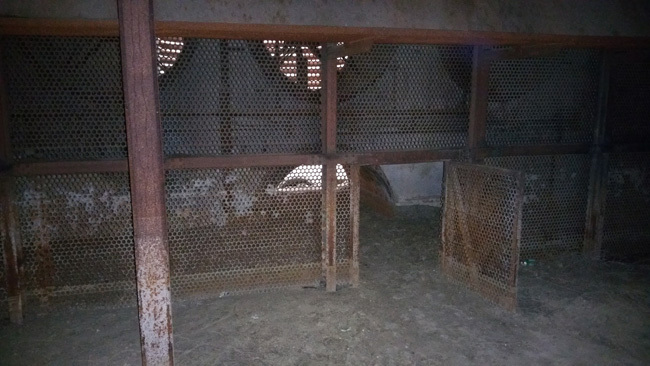 Large hoses and connectors were scattered throughout the chamber. 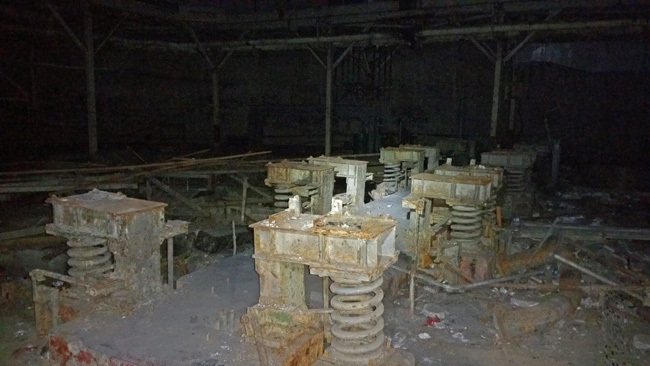 The thick metal springs pictured below served as mounts for the generators that once occupied the power house. Quite a bit of trash was scattered on the ground and a pile of ashes and charred beer cans marked the spot where someone had built a bonfire. 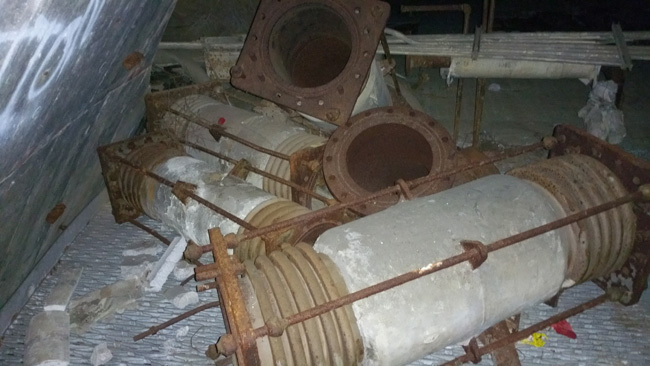 There were other strange pieces of equipment in various states of decay. Double doors led into a corridor with many branches leading off from it. It also contained the charred remains of a couch. I have no idea how it ended up there. 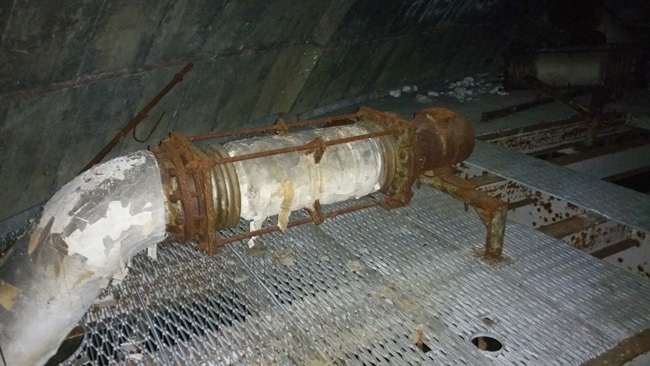 It must be an artifact from when the place was an active military installation because I can't imagine how someone could have gotten it through the narrow entrance to the complex. This black ghostly figure with white eyes appeared in several places throughout the complex. 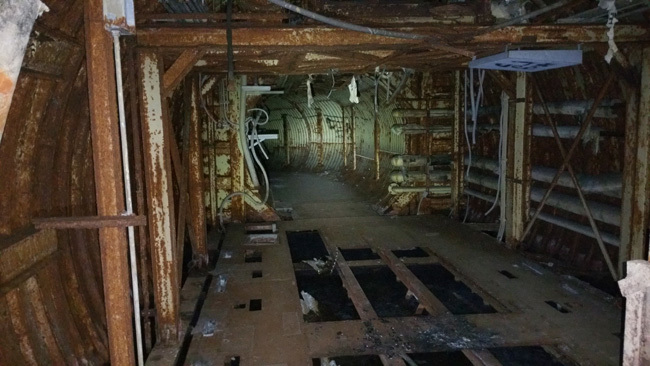 Just off the corridor is a tall room with a large elevator that was used to remove the last of the salvageable equipment from the site about 15 years ago. 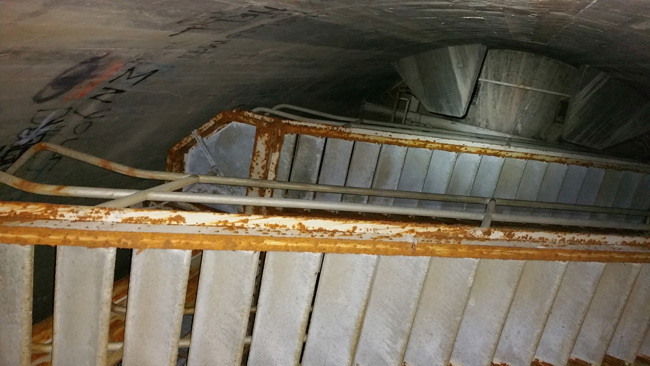 I climbed the stairs that wrapped around the outside of the shaft. with clever graffiti on it. The wall was separating, allowing a draft to enter from outside. Some of the corridors were extremely long. To give you a sense of how far they stretched, I stopped in the middle of this one and took a picture in both directions. No end in sight. Eventually I reached a room where a hatch in the ceiling hung open and snowflakes drifted down from it. I looked up at the sunlight streaming down and considered climbing the ladder up to the surface, but without any idea of how stable the ladder was, I decided it wasn't worth the risk. I made a mental note to look for the shaft when I got back up to the surface, but I wasn't able to find it on the huge piece of land. 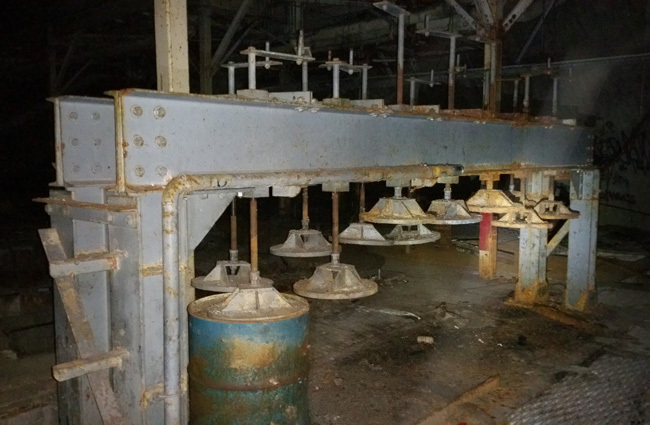 Many sections of the facility were flooded with water discolored by rust and chemicals. Most of the walkways were removed, leaving only metal beams, so I had to remain surefooted to avoid plunging into the icy water. 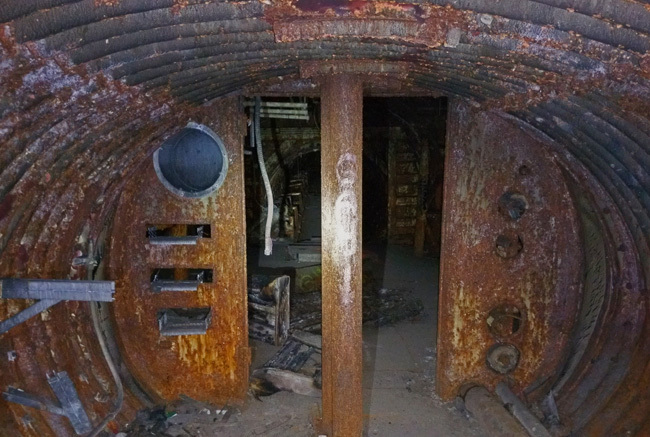 Each section of the complex had thick metal blast doors that weighed 3 tons apiece. 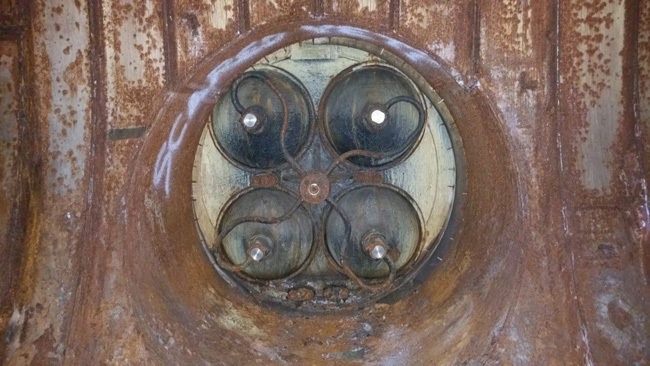 The hinges of some were so rusty that they could barely be moved. 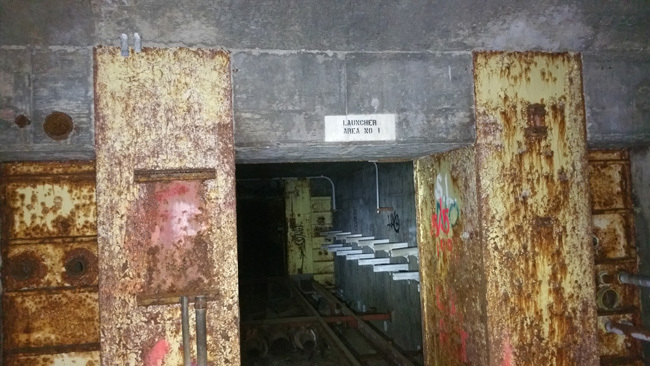 There were three launcher areas, each marked with a little sign painted above the entrance. Each had a corridor similar to the one pictured below, though not all were flooded. 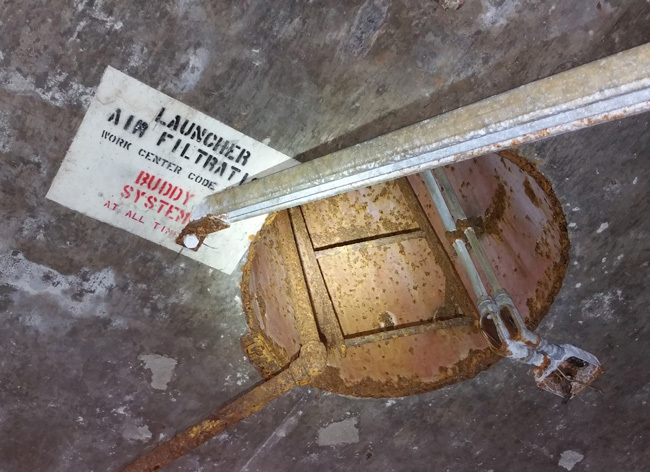 A sump pump was located in every launcher area, but without power they are useless. Someone left an inflatable raft behind, probably from a time when the water level was much higher. 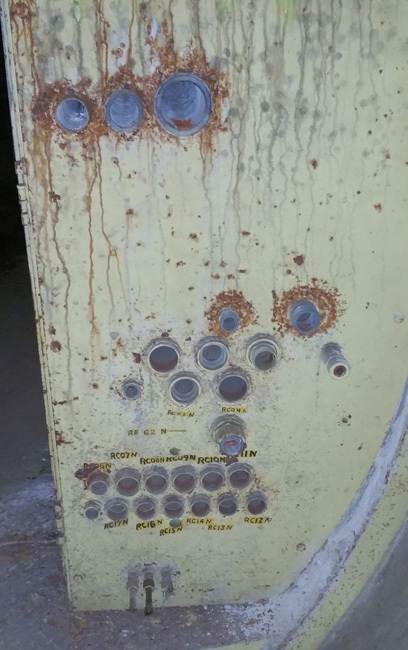 The moisture has caused every metal surface to rust over the years since the facility was abandoned. The actual silos that housed the Titan rockets are enormous. Standing at the edge and looking down at the abyss below is a terrifying experience. 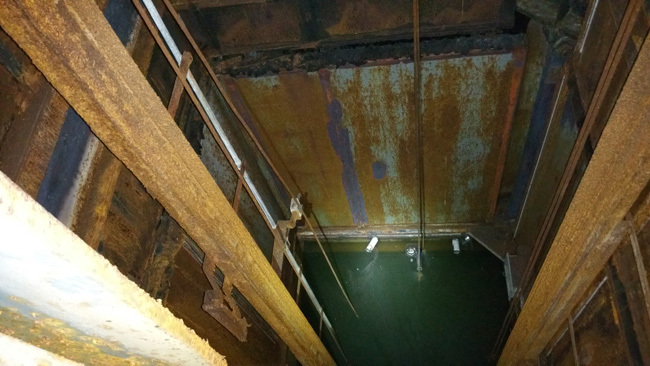 It is at least a 50 foot drop to the contaminated water that has accumulated inside them, and probably extends another 100 feet to the floor of the silo. I can only imagine how horrible it would be to fall in. Despite the darkness and massive size, I managed to get a picture of the blast doors, which weigh an astonishing 115 tons each. The Titan I Missile was the US's first Intercontinental Ballistic Missile (ICBM) stored in underground silos, and the first with a multistage propulsion system, which gave it greater range than Atlas missiles. 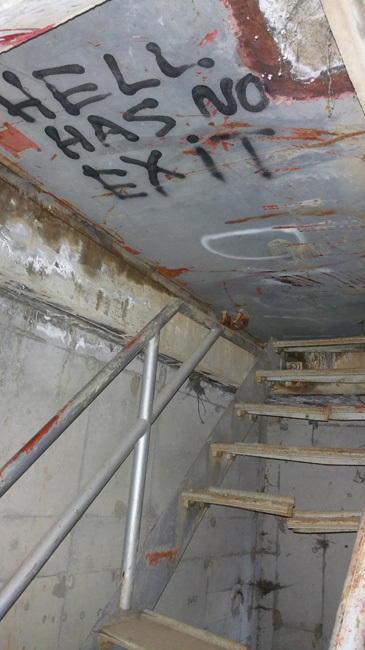 It is strange to walk through the dark, rusty corridors of the abandoned facility and think about the threat of nuclear annihilation that weighed upon the nation's conscience throughout the Cold War. The threat still hangs over our heads today, but people don't seem nearly as concerned. The Titan I Missile program was incredibly expensive and inefficient. Each Titan I launch complex cost $1.36 billion to build, adjusted for inflation, and only operated from 1962 to 1965, when they were made obsolete by the Titan II. Titan I rockets had to be fueled up from the underground storage tank immediately prior to launch, then raised above ground on the enormous elevator system, leaving it exposed for some time before launch. The entire process took fifteen minutes, a slow reaction time compared to the Titan II, which used hypergolic propellants, which could be stored inside the missile. After deactivation, the Titan I missiles were scrapped or donated to museums. 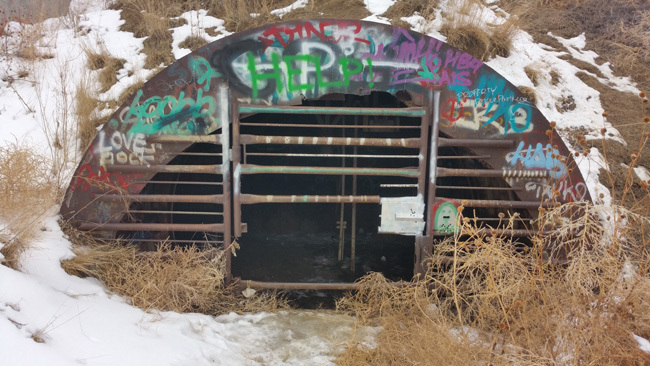 Most of the decommissioned ICBM silos were sold to private parties and have been repurposed or sealed off, but after more than fifty years, the Deer Trail site still remains abandoned. After nearly four hours of exploring the incredible ruins of the Titan I launch complex, I emerged into the freezing Colorado air. The sight of my car filled me with relief; I half expected it to be towed away, or to find a police officer waiting for me to emerge, but this time I lucked out. I drove around the property to photograph the interesting above-ground structures. I could only snap a few shots before my fingers became too numb to work the camera and I had to retreat to the car to warm the feeling back into them. 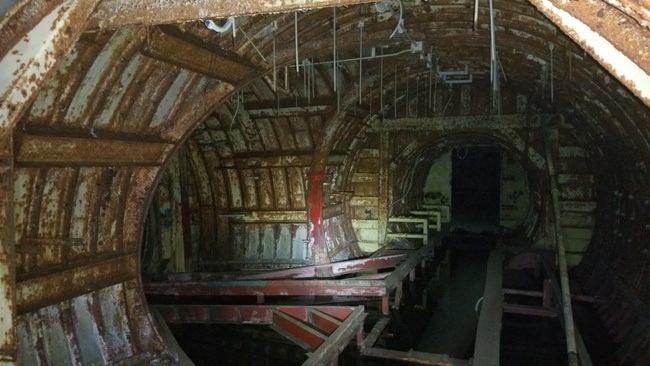 I cannot begin to tell you how thrilling it was to explore this incredible relic of the Cold War. I've never seen anything else like it. 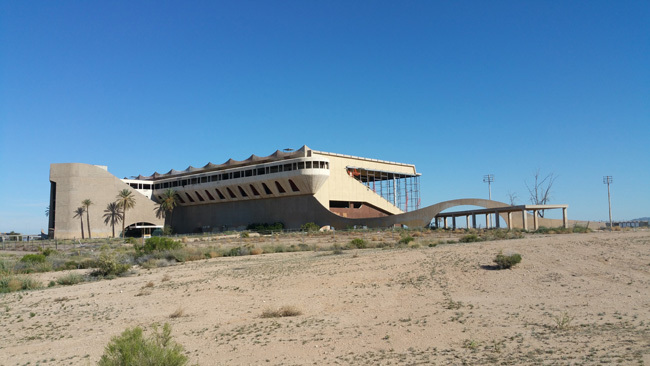 If you read my article about exploring Phoenix Trotting Park, you might remember that afterward I was shaking with excitement and the thrill of accomplishment. The way I felt after exploring the Titan was similar, but a thousand times more intense. 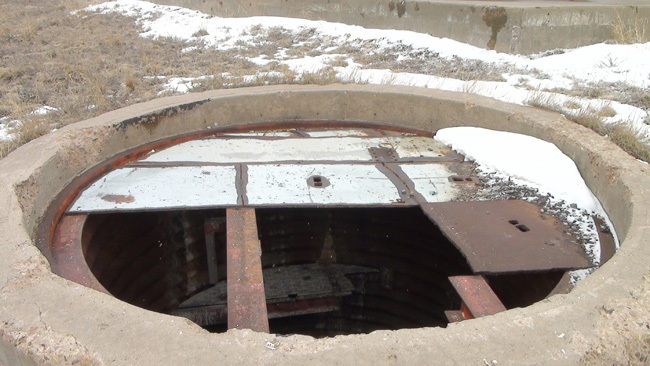 If you ever get the opportunity to check out the Titan I missile silo launch complex in Deer Trail, Colorado, I highly recommend you do it. But please realize that it can be extremely dangerous if you aren't careful. I would feel awful if anything bad happened to someone who decided to explore the Titan after reading this. Be sure to bring at least one high-powered flashlight and a headlamp (for optimal photographic excellence, bring as much lighting as you can, and use a camera with a good low-light sensor). Please bear in mind that there are many places where you could easily fall a great distance or into icy polluted water, so watch your step and take your time. Also be aware that there is a lot of dust and some asbestos in the air. Be sure to wear a dust mask, or better yet, a breathing mask with filter cartridges. One thing you don't need to worry about is radiation. 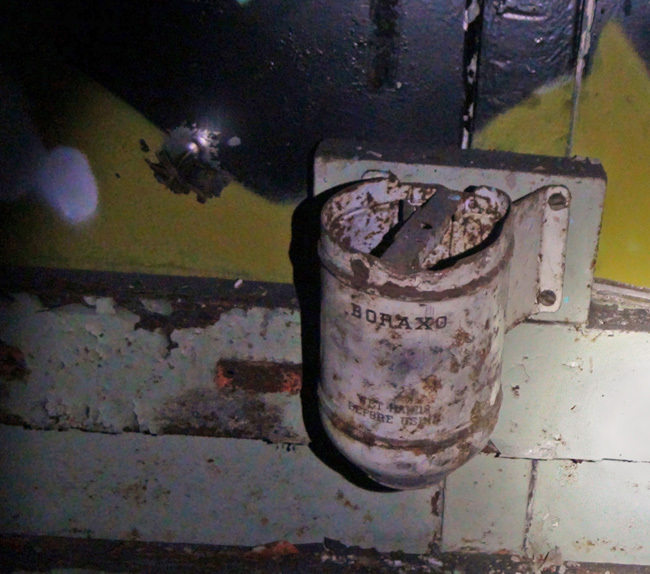 The radioactive material in the Titan missiles was well contained and was removed with the missiles. I suppose there could be low levels of radon, but that is true of any underground structure, including your own basement! I felt so grimy from exploring the abandoned missile silo, I definitely needed to wash up afterwards. 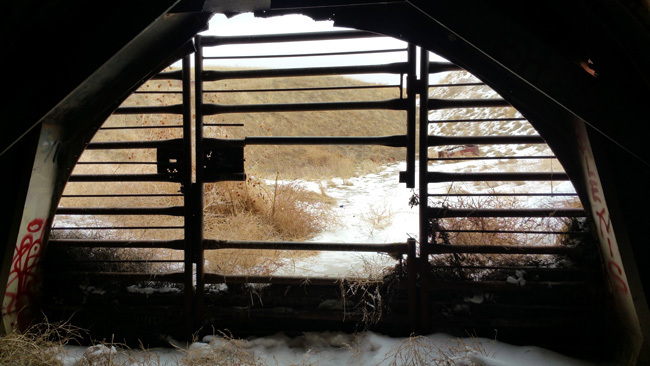 Join me again next week to hear about my exploration of one of Colorado's abandoned sugar mills. Wow, I never realized how huge the Titan bases are! They are an absolute labyrinth/underground city compared to the Titan IIs. Great writeup and pictures, thanks for posting. Really enjoyed it! Thank you! I was amazed at how long the tunnels were. I sure got my exercise exploring that place. 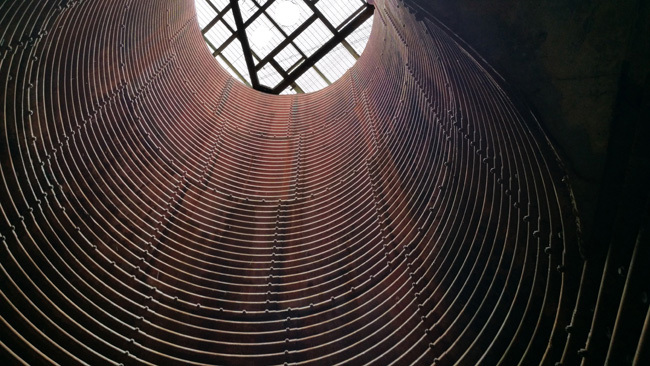 You've been inside a Titan II silo? I haven't had the opportunity, but I'm hoping someday I will. 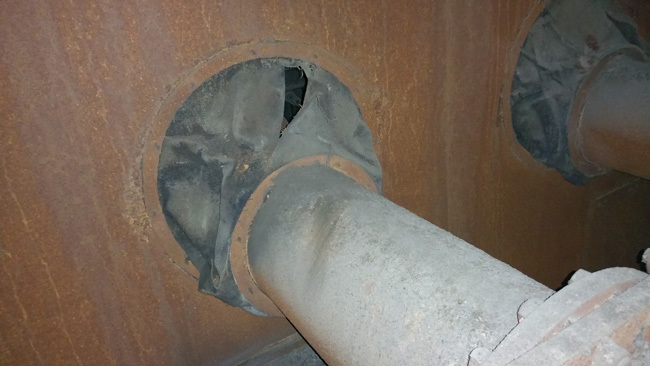 It does not surprise me that the ventilation system was not marked on the diagram. That appears to have been a drawing from the era that they were active and knowing where that system was would have been a very large security issue. Drop some gas down there or something much worse and there goes the crew. That is a really good point. Thank you! 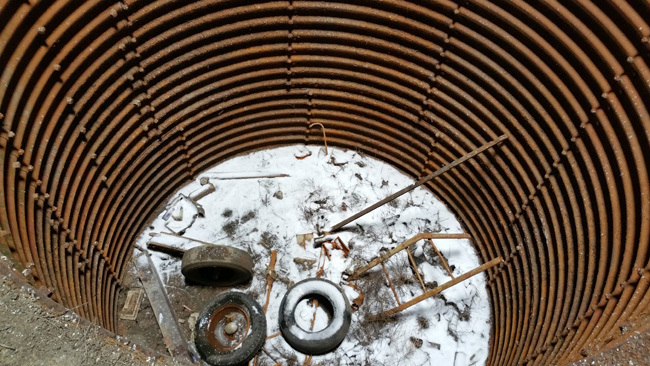 Nice writeup, I haven't been to the Deer Trail site in years! 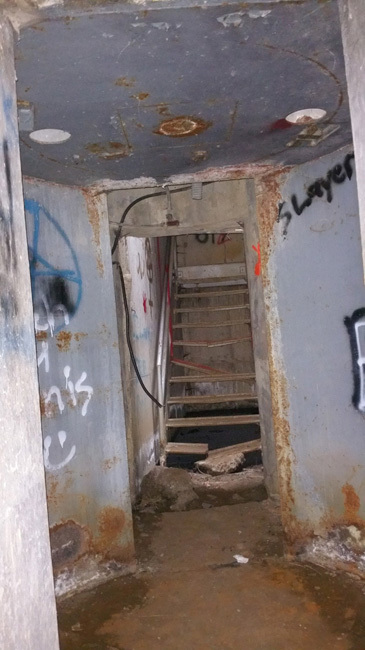 Abandoned missile sites used to be something of a hobby of mine, and I had loads of info on them at one point. Also, the "entrance" that you went in wasn't actually an entrance. 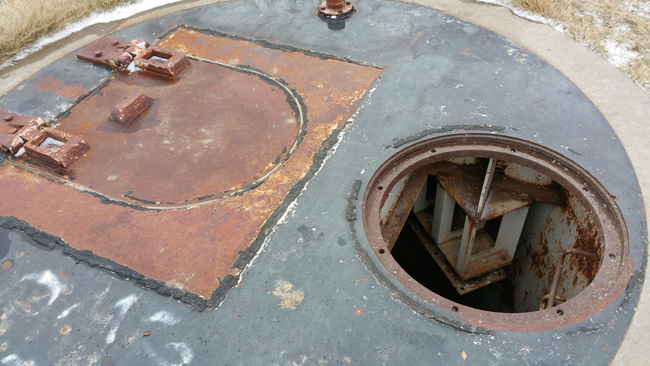 You may have noticed the giant tank sitting aboveground: that used to be where the "entrance pit" is, decades ago. 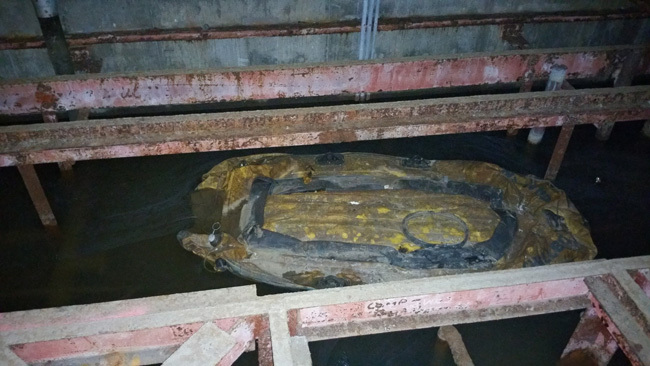 It was excavated for some reason, but nobody was sure if it was due to site salvaging after it had been decommissioned, or if a later property owner had done it (yes, that site is on private property. I got a trespassing ticket their about 18 years ago, and the court documents noted the owner's name and address. Not sure if he's still alive or not, but he was an old curmudgeon who was known for having some screws loose.) The sites were salvaged by the Air Force after they were decommissioned, although some salvage companies did a more graceful job than others. 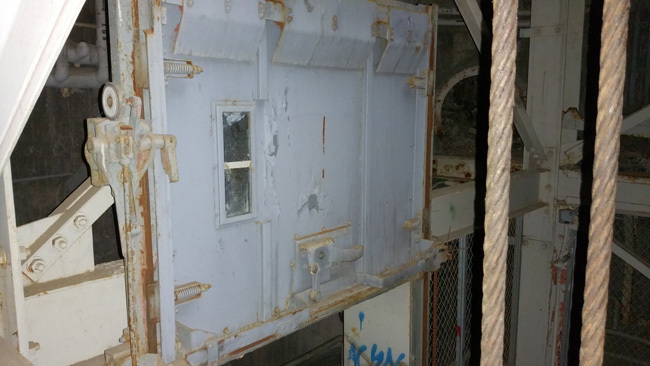 One site in Washington state had a giant hole cut in the power dome to remove the generators by crane; in the late 90's or early 2000's, a teenager died when he decided to rappel into that dome and somehow fell from his rope. Regardless, the Air Force never filled in any of the Titan I sites like they were supposed to: they simply salvaged any equipment they wanted to keep, and walked away. They did the same with most Atlas sites, although Titan II and deactivated Minuteman/Peacekeeper sites were dynamited to adhere to international arms reduction treaties. 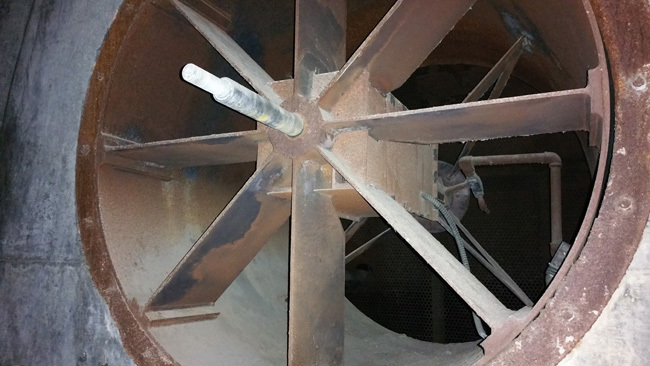 I'll also mention that the dust collector system was primarily meant for use IF there was a nearby nuclear detonation. It was meant to cyclonically separate out contaminated particles, so the base could be supplied with clean air even though it would've been completely sealed off to the rest of the world. Of course, that's based on the assumption the site wouldn't have just been tossed into the upper atmosphere by a Soviet warhead, which is probably the more likely scenario had SHTF. 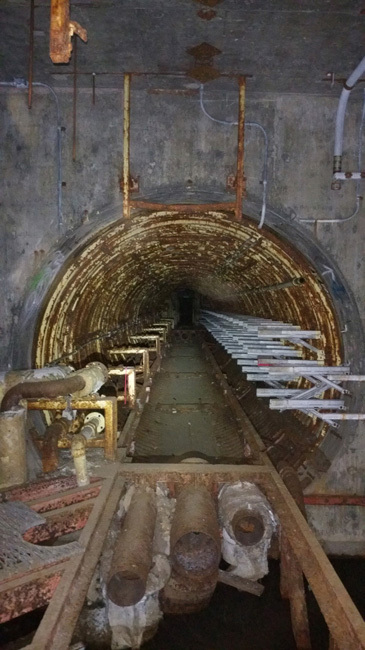 Having spoken with quite a few retired missile site personnel, most of them were well aware that they'd probably be vaporized in the event of a nuclear war, despite the military continually trying to sell the "surviving underground" thing. You are incredibly knowledgeable! Thanks for all the info! I made a few corrections based on the information your provided. I took a ton of video while I was exploring the place. I need to edit and post it on youtube. After reading your comment, I watched the part where I get to launcher silo #3. It was so scary and exhilarating to stand at the edge of that huge drop. 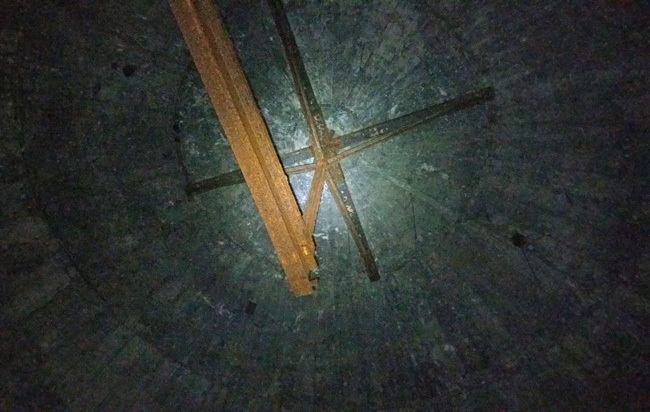 If I ever get a chance to visit again, I'm going to bring a lot more lighting so I can actually get a picture of the inside of the launcher silos. The flashlight I brought barely made a dent in the oppressive darkness of that huge space. Fred Epler sounds like an amazing person whom I wish I'd known. Has someone held onto the documents since his passing? It would be a shame to lose the fruits of his labor. Great post! I absolutely love this place. I have been many times and know it by heart. Every time I visit, I am blown away and filled with wonder at the enormity of the location. Glad you could make it! Thank you! I love this place too. I've only been the one time, but I'd love to go back. It's so awesome. Send me a message on Google+, Instagram, or Facebook. I'll write you back with coordinates, advice and other info that might be of use. Great stuff! (As always). One question, going into the TITAN or the PHX Trotting Park, do you go alone? I think the trotting park would be okay to explore alone but that's nuts to go into the TITAN alone. Looks very dangerous! I've had no choice but to go alone to most of the places I've explored. I'll admit it's pretty dangerous and nuts, but I've found it nearly impossible to convince anyone to come along with me. Most of the people I know are either too scared to go or have no interest. I take as many safety precautions as I can, and if anything terrible should ever happen to me, at least I'll have died doing what I love most. Wow, what a historically interesting but seriously creepy place. 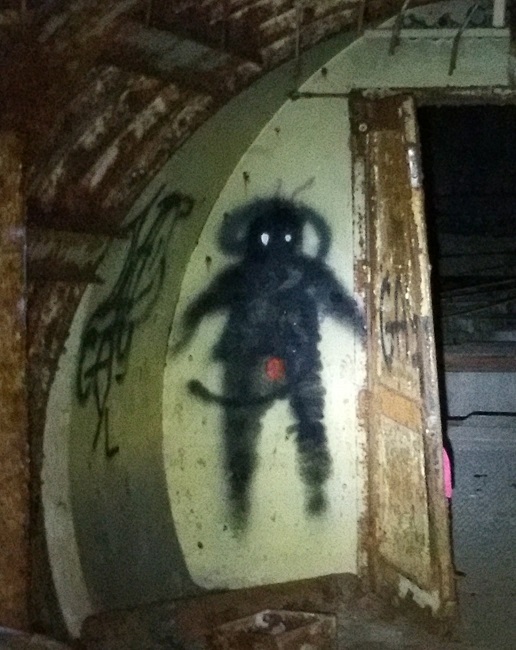 All that rust and that graffiti of the white eyed creature. Frig I could never have done this alone! I was so surprised to see that some of the openings above ground haven't been sealed off for liability reasons. Great pictures and fantastic post. It truly was one of the most interesting places I've explored so far. 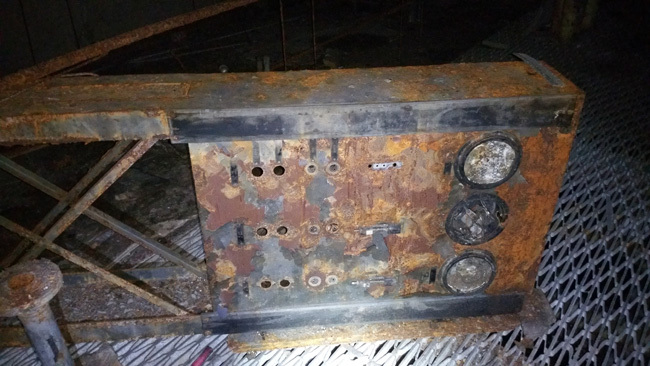 I wish I could have seen it before the control panels and other interesting artifacts were removed. Thanks for this. It's been many years since exploring back in the early 80's when I was stationed at Buckley ANGB. Went there a few times to find there was still dated maintenance paperwork laying around. It's been so long I forgot where it was. I'll have to visit again sometime. It must have been amazing to see in the 80s, before everything was removed. It was still very awesome when I was there, but abandoned places are always more interesting when artifacts are still lying around. So did you get permission from the property owner? I've heard that many people who go in the silo without permission get prosecuted. Thanks. You do need to get permission from the owner. I don't think it's accessible anymore though. I heard the owner got sick of trespassers and decided to close it up. You can still get in as of July 2016. They sealed the ladder but you can get in through the large gated opening. Good to know. I assumed incorrectly that they had sealed up the gated opening. I went late in the summer of 2015 and there really weren't any "no trespassing" signs, the road was clear, and my group was perfectly fine. I tried to return about four months ago here in 2016, however, and the owner was patrolling his land with his dog. One of my friends talked to him, and he sounded really angry and said too many people were coming, along with some exaggerations. If you talk to the guy at the gas station, he will tell you too that people have indeed been arrested there, that it all started when the place first got posted online. Either somebody threw a ridiculous party there, someone got hurt and tried to sue, or the traffic really did just become unbearable. Needless to say, signs are posted everywhere now and the main road is blocked with metal debris. Sadly, this one is off-limits now. I was lucky to see it once, and was lucky I came the second time when he was already out, or I'd have a mark on my record now. Thanks for commenting. It's a shame the place has become off-limits. I'd hoped to go back one day, but it seems like that's no longer a possibility. I'm glad we got to see it before it was too late. I just happened to check back on this thread today. 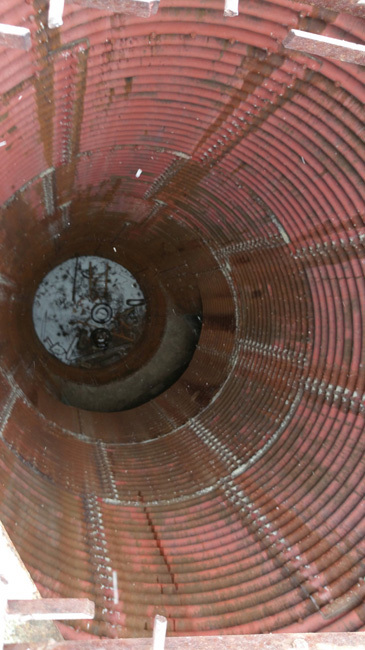 Yeah, that guy from the gas station said there are definitely other silos around, but he said they are likely to be far more tightly locked down (this one was opened up for environmental cleaning or something like that). Also, people have been visiting it for decades...until now. Yeah, you'd probably have to recruit a friend to do a night drop-off and coordinate the pick-up. He's not going to scour the insides for people, he probably just checks for cars then calls the police. It is his property though and he has a right to not want people on it. Besides, the greater the length you go to get in, the less credible your defense will be if you do get caught. It's a shame. I'd gladly sign a waiver and drop $100 to go back. He could really make some money from that place. And then people could go legally. Win-win, right? I assume it's completely cut off now? I believe it has been completely closed at this point. The local news ran a story about how he was blocking all of the available openings to prevent folks from entering the complex. He is quoted as being concerned about the potential for liability and technically he would be liable since it is foreseeable that someone would trespass to visit the complex which has many identified potential dangers and could likely be injured. He is liable since he is the possessor of the property and he is aware of the dangers and had previously not remedied the situation by closing the opening and preventing harm to trespassers or any type of visitor. On a different note, the Titan Missile museum outside Tucson is amazing and a fully intact missile complex that is open to the public. If you are passing through I highly recommend you visit the museum, it apparently looks the same as when it was still active from the 60's to the mid 80's. I was stationed at "5B" in the mid 60's. Pictures brought back a lot of memories. Worked in the powerhouse. That must have been an incredibly interesting place to work. I bet you have some great stories from you time there. Pictures are great! I referenced photos like yours for my fiction novel The Last Of The Titans. 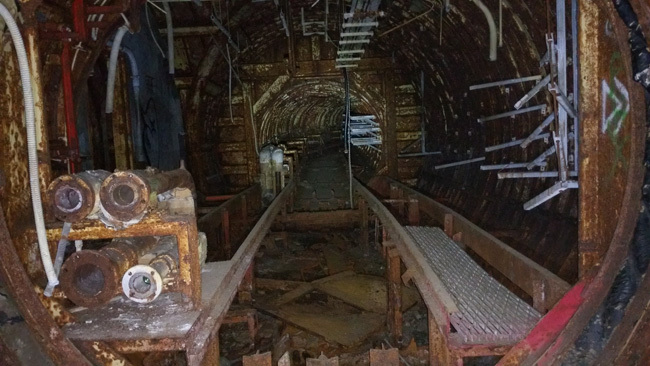 It centers around a 1960s era Titan 1 site and missile which was buried and then reactivated decades later. 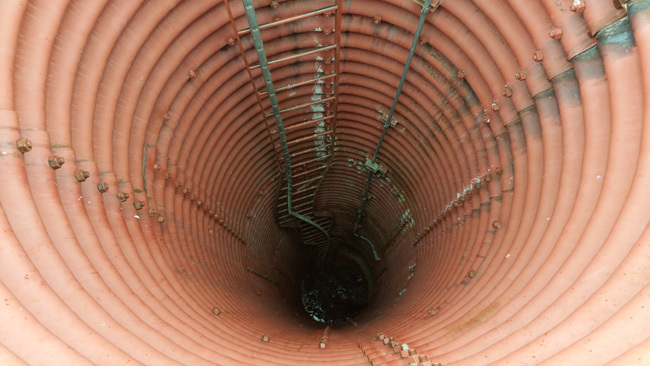 I would love to explore one of these sites but I'd probably end up at the bottom of a shaft! I think I'll visit the Arizona Titan museum instead. What a great idea for a novel. Have you published it yet? I need to go to the Titan museum one of these days. I've heard it's amazing. I've never gotten pictures of ghosts. I know that this sounds self absorbed of me. 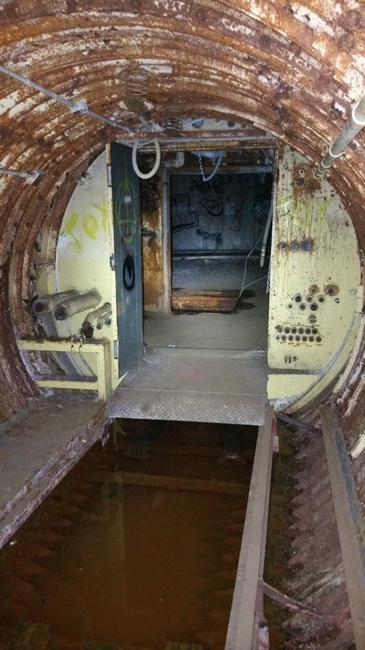 I never been inside a missile silo at all. Watching a couple of videos. Because I wanted to see some illustrations of a Titan 2 missile silo complex. They I went to yahoo. Searched found a website. It was to YouTube. This guy chose is ideal missile. Found the owner, purchased it & started to do some work on it. Even started to so some renovations on it. I really wanted some illustrations for a missile silo complex Titan I. Then I said now that gives me an idear(I know its misspelled. Its on purpose). If I got super rich. 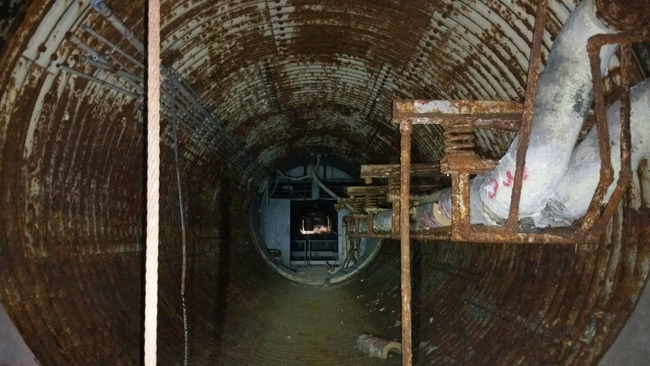 I would love to a Titan I missile Silo complex. To put forth all the effort. Into putting up the money for opening it. Clean up and renovation too. But that's a dream. By the time I looked into this place. It would be bought, sold & renovated. Still it would be a great place for my family & friends. That's always been a dream of mine too. 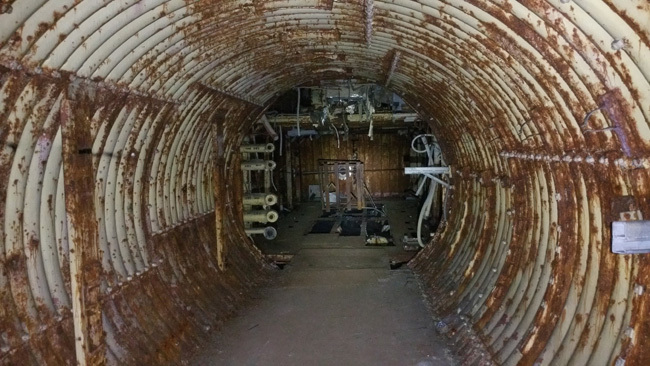 I'd love to fix up an old missile silo and live there. Hey Jim, I would love to go see this place some time. 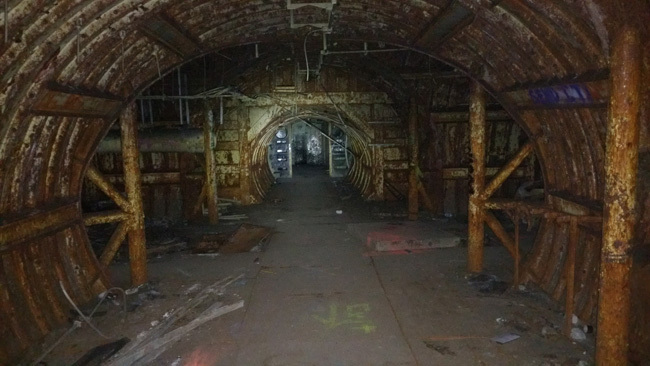 I have always been a fan of exploring abandoned cave mines and buildings, and think this would be a good one. I've been trying to figure out how to message you but can't figure it out. If you have a chance can you email me the coordinates at davisreynolds1234@gmail.com. Would really appreciate it. I used to visit site 2A (Army National Guard facility near Bennett) when I was in High School back in the 1980s. Unlike the Deer Trail site (site 2B), it has not been excavated all the way down to the tunnel level and cut open. 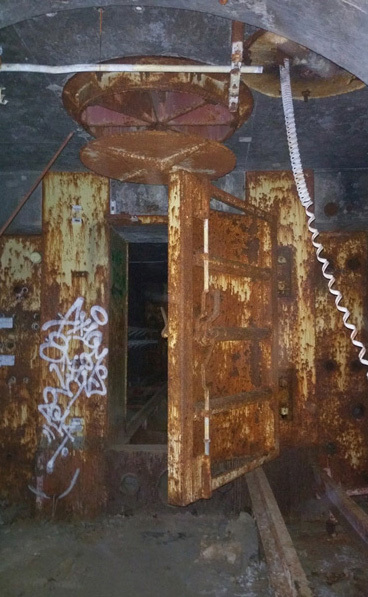 Entrance is gained through the original hatch and corresponding stairs that descended around the the equipment elevator shaft. 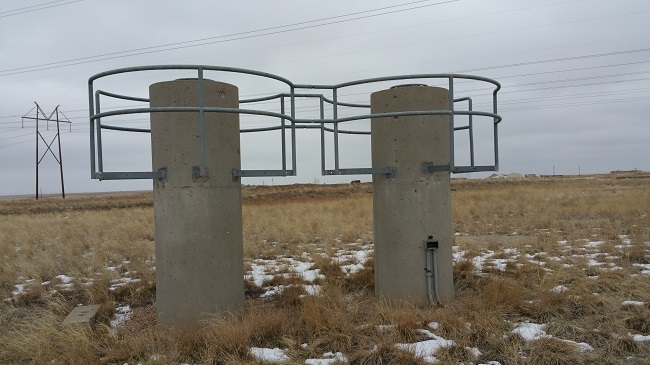 In total, there were 6 Titan-1 sites in Colorado, each containing 3 erector-launchers; Titan-1 ICBMs had to be erected outside of the silo before being launched, whereas Titan-2 ICBMs were launched from inside the silo. All were under command of the 725th Strategic Missile Squadron (SMS) located at Lowery Air Force Base in Denver in the 1960s. By all accounts, the Titan-1 sites were the largest missile complexes ever built. That Sept 9th youtube.com search for deathwearsbunnyslippers. The comment is from me Mike Rindos. I grew up in DeerTrail and we used to go out there all the time. 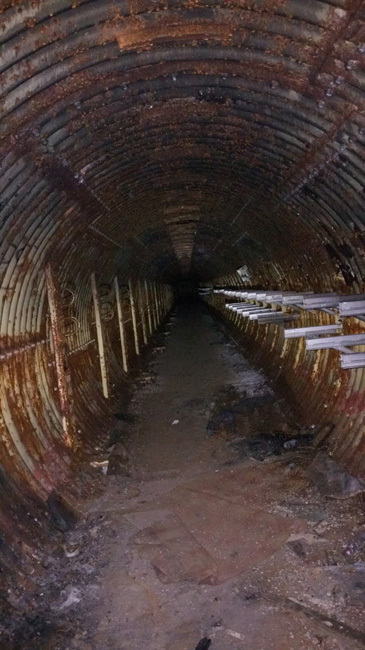 We done a lot of target practice out there on the surface and we would explore the tunnels while we were out there. 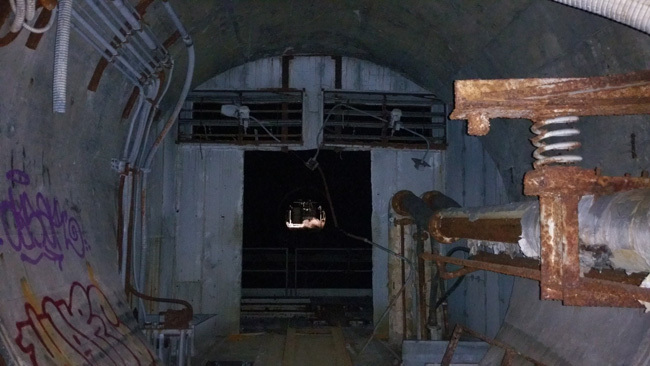 The large door in the pics, that says He'll has no exit, is the actual main surface entrance. It used to be open and that's how we would descend inside. 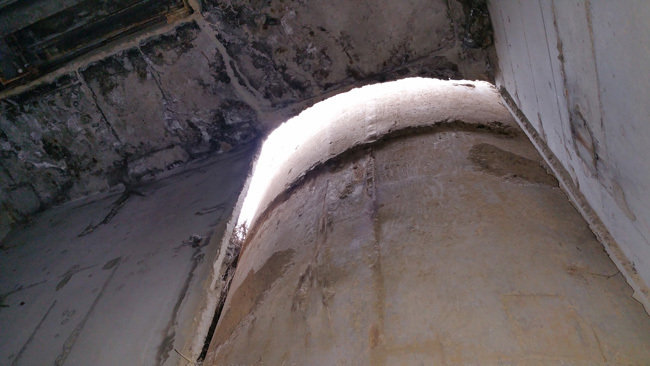 The large hole where the steel bars are over the tunnel come from removal of storage tanks. The last time I was in the the bars were not in place. It's a very creepy but interesting place to visit. I never thought it was much f a big deal growing up right down the road from it but I guess it really does have an appeal to the adventurous. You must have had so much fun exploring it as a kid. It's hard to imagine the silo wasn't always covered by bars. So dangerous. I wish I could have seen the place when it was in better shape. Do you guys know the property owners and if they will call the police if we try to get into the silo?? I saw a 9 news article that says 30 people have been arrested there in one month in 2016. This seems exaggerated at best. From my understanding it's been sealed off for good and can no longer be accessed. You are a braver soul than I! I have SEVERE claustrophobia and found myself at times a bit panicked just from your extraordinary photographs! Thanks for letting me live vicariously through you, as I will NEVER experience this particular tour! Love, love, LOVE your site! That must have been such interesting work! The scale of such a project is difficult to wrap my head around. I wish more of these old complexes were open to explore. One of the most fascinating sites I've ever visited. DO NOT GO HERE! I AM FACING UP TO A YEAR IN JAIL FOR 2ND DEGREE CRIMINAL TRESPASSING! THEY WILL TICKET YOU AND YOU WILL GO TO COURT! THIS IS PRIVATE PROPERTY. If I ever get a lot of money a lot more then what this is worth. I would love to buy it so my family can experience a real winter, spring or summer. After it's renovated with houses in all access points above ground. I wonder what the price tag in purchasing it. I'm just curious. I was in the Othello Washington area when I came across an area In the middle of nowhere. I noticed what appeared to be an old asphalt road and some concrete areas. I was thinking it was really weird then my girlfriend looked up the area where we were and sure enough we were on top of an old missile. Now being me I couldn't leave it at that so I did some walking around and found an entrance. I called it's day and came back the following weekend and went inside. Didn't go very far to find it was blocked by sand and dirt. But now really interested in seeing more. That sounds fascinating! I wonder if the whole place is filled in or if it's still possible to explore. Hey Nick Adamescu! I hope if I ever get a lot of money. 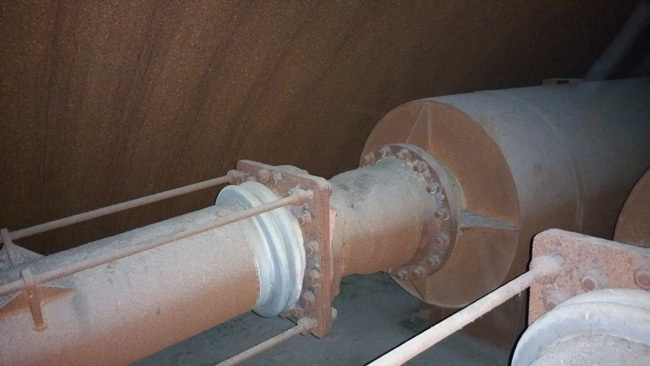 I would love to hire you on as a expert in Titan 1 silo complex's so that everything is how it should be. I wonder if its for sale. It would be a wonderful place for my family. That's a good dream to have and hold on too. I would still live in the city grew up in. That's in a future where I'm super rich. It will have to remain a dream. I went with 4 buddies of mine an explored it during the first week of June, 2018. The owner had barred off the entire entrance but someone had come with a shovel and dug underneath all the grates. I'm 6'0" and 185lb and it wasn't too tight but I had to do some wriggling. 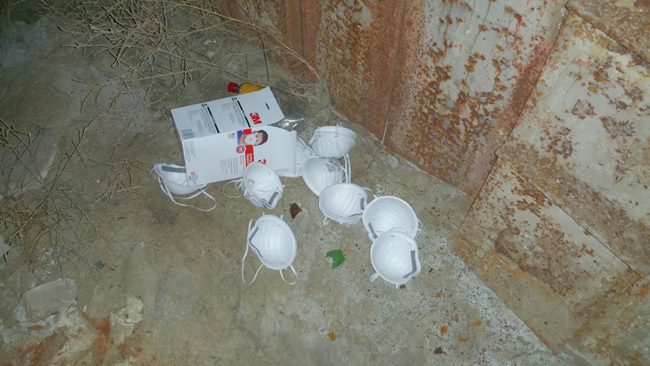 There is rumored to be asbestos inside and to be safe I wore a P100 rated mask. 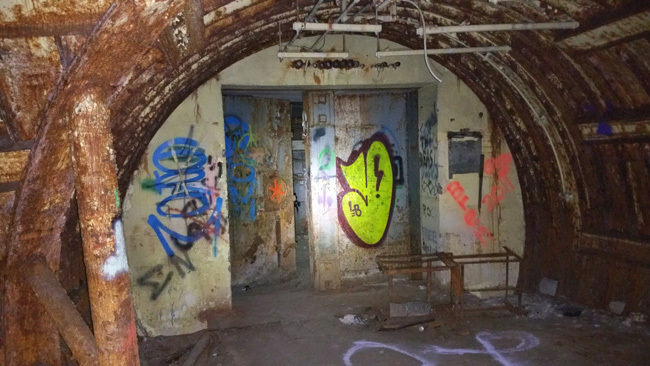 Spent about an hour exploring only the power house and surrounding tunnels but had to leave when we encountered a group of 15 highschoolers. When you're driving up to the silo you need to go by houses and they obviously know what you're doing if they see you. When I went I parked on the side of the nearest road away from the houses an walked a mile through the fields to reach the entrance. If you do this quietly during nighttime and don't use flashlights you have little risk of being caught. Do you know if it is still possible to get under? Looking to start exploring, and this is rather nearby. I went SCUBA diving in one of these a few years back, in Royal City, WA. 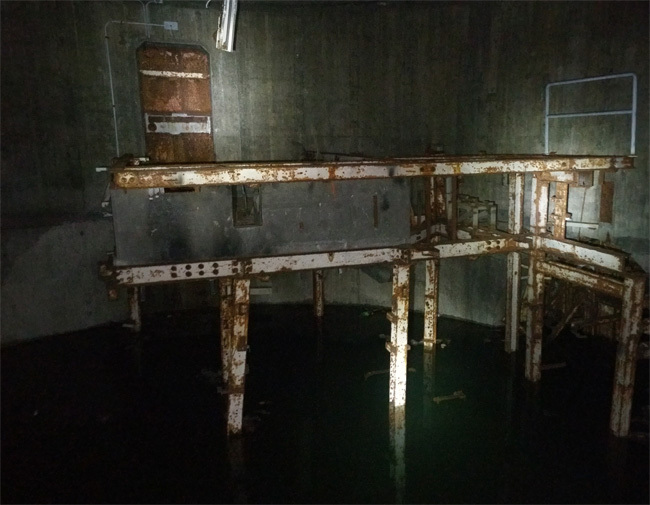 The power house and control center were above water, but we made entry through an escape hatch in the middle of the complex and dove silos 2 and 3. What a neat experience. I'm always looking for adventures, and live in the four corners area. Hopefully I can find another of these somewhere close. That must have been amazing! I wondered what it might look like down in those silos. The water mus have been freezing. Did you see anything interesting down there? I wish I knew of another site like this that was open to explore. If I recall correctly, the water and air temp was pretty constant in the 60s year round due to ground temperature. I had a hefty wetsuit, and it was actually comfortable considering it was below freezing and snowing outside! 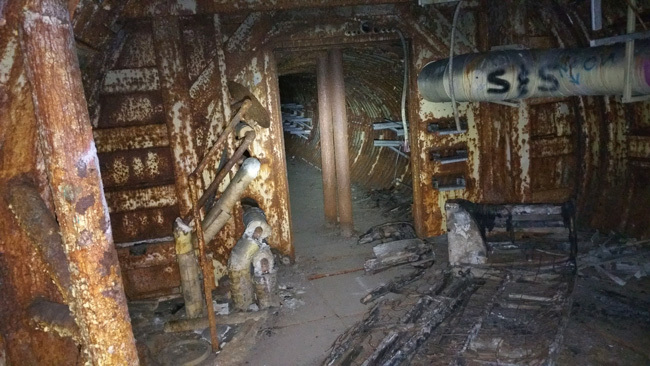 The long tunnels to the silos were chest deep in water and half of the floor panels had been salvaged, so it was interesting stumbling around and stepping in holes without seeing your feet. 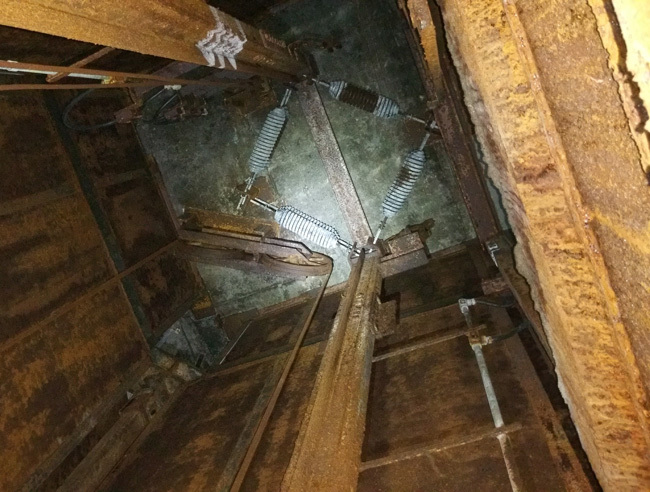 To get into one of the silos we had to squeeze through a hole into an elevator shaft underwater, which was a tight fit and just about required somebody pulling and pushing you. 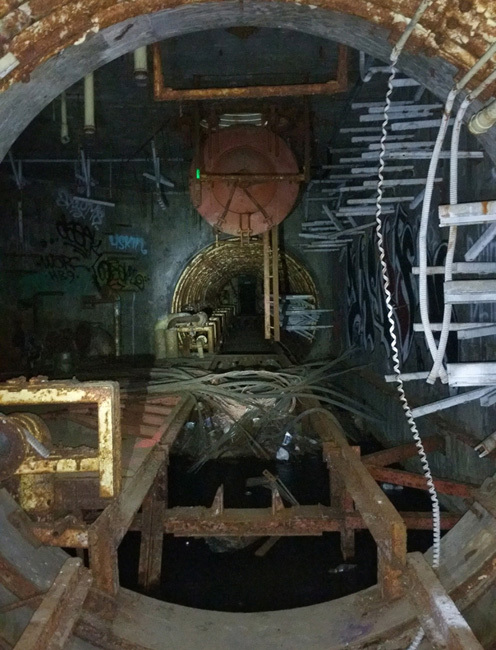 There wasn't a whole lot to see after salvage, but it was eerie to swim through an industrial complex and see all of the warning signs and eyewash stations a hundred feet under water. I would love to find some more to explore! 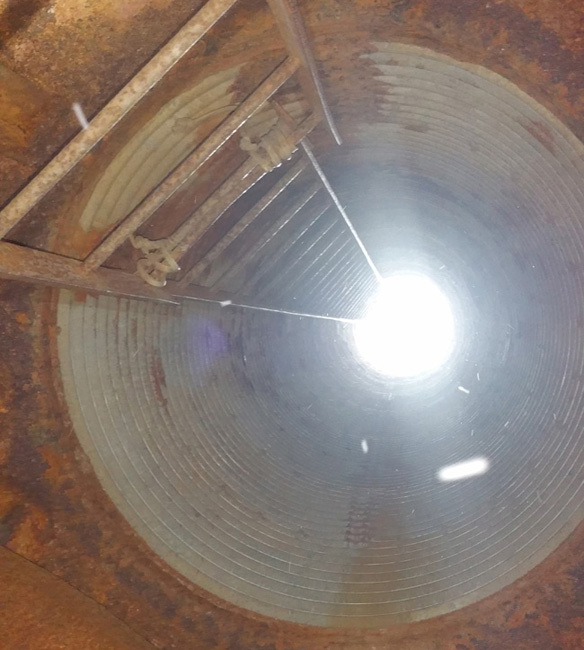 To follow up on my post above from November 15th, it IS still possible to enter the silo. I went on December 30th with 7 guys this time instead of 4. 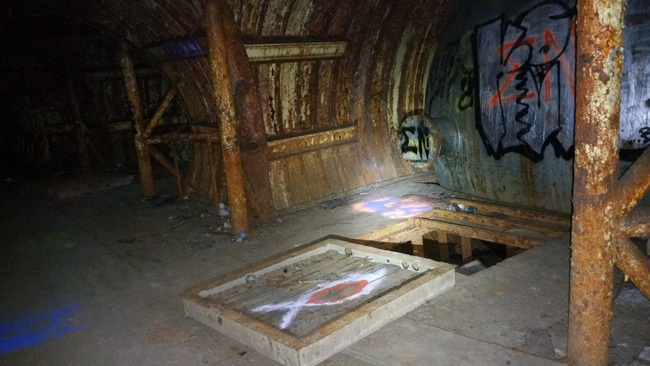 There are a few areas you can enter the silo from but the safest is the spot where you walk down into an excavated area and don't have to do any climbing. As I said before the entrance is nearly barred off but people have come and dug underneath the bars. One of my friends is a football player and is 6'1" and 220 lbs and he nearly got stuck on the way in and on the way out. The gap between the bars and the dirt ground is only about 10 inches and the hardest part of getting through is your legs because if you go face up underneath, your legs end up being straight as they go through which places lots of stress on your knees if you're a bigger person. Just like last time, I parked about 3/4 of a mile away from the entrance to avoid being seen by the property owner. This time however, I parked to the east of the silo instead of the west and walked in on a dirt road which was much easier than walking through a field like I did last time. I wouldn't be surprised if the entrance was more blocked off in the future, but for now it is still possible to get in. If you would like specifics on good places to park and how to get from good parking areas to the silo, please email me at missilesilostoose@gmail.com. I have heard from a few different people that there is a really cool homeowner nearby with a huge American flag. I was told that if you park in front of his house and then knock on the door he will show you maps of the silo, give you a place to park, show you how to get in, and might even give you some extra masks and flashlights. Not sure if this is true because I haven't tried and not sure which house it is, a there are 4 or 5 pretty close to the location of the silo. 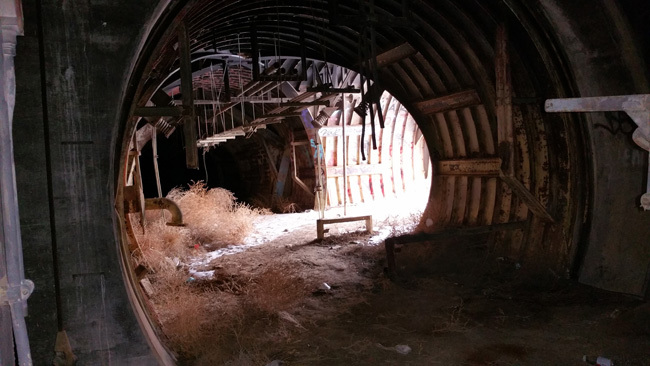 We successfully explored around half of the silo in 90 and made it out with no tickets. I did, however, get a speeding ticket on the way back on I-70. Like I said before, if you park far enough away from the silo to not be seen and if you're quiet on the walk in, there is little risk of being caught. If you're looking for information on how to get to/how to explore the silo, please email me at missilesilostoose@gmail.com. I have a very extensive document detailing how to get to and how to enter the silo. Chuck Hill again. WOW! As the old saying goes, you've got more guts than a government mule! Thanks for the outstanding pictures and views in this post. I'm sure I'll NEVER get there, despite the fact that I lived within about 45 miles of this place for over 30 years. Awesome work! Take care and BE CAREFUL!